William John Law was the only son of Thomas and Margaretta Law. He was born in Cookstown on 10th April 1879. All three known children were born in Cookstown. His father was a Royal Irish Constabulary Sergeant. William was educated at Derryloran School, Cookstown and Trinity College. He subsequently became an Inspector of Factories. In 1906 he joined the 7th Lancashire Fusiliers. 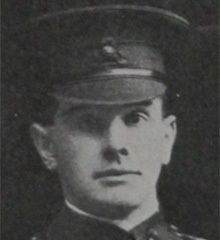 Lieut Col William J Law was killed in action on 19th December 1915 during the Gallipoli campaign. He was mentioned in despatches twice and was awarded the Croix de Guerre.